- Leveling and stats mechanics editing. - Load plugins (.esp) and master files (.esm) data. - Editable plugins load order for editor, include/exclude setting page. - Saving textures and meshes to BSA files. - Fixed several bugs. Additional Info: - Not compatible with Extended Color Sliders. Not recommended to include this mod in the plugin load list. Features not implemented and known issues: - Problem rendering hair and facial hair with tranparency. (See Technical below)_____________________________________________________________________________________________________ WHAT DOES IT DO? _____________________________________________________________________________________________________Despite the name, this program is actually a NPC mods generator. Mods generated by this program are modified copies of existing NPC records in the Skyrim game data.NPC record holds data for a multitude of NPC attributes such as A.I. behaviours, skills, hairstyles, eye color, factions, inventory content, spells, abilities and many more.By overriding original records with mods, you can actually make changes to NPCs in game.This program strictly produces mods and do not alter you original Skyrim data in any way. Further details are illustrated below:_____________________________________________________________________________________________________ HOW DOES IT WORK? _____________________________________________________________________________________________________Extract and run setup.exe and follow on screen instructions.This editor requires XNA 4.0 framework and .Net framework 4.0. This will be automatically installed if your system does not already have them.You also need Skyrim game installed on your machine. If the program cannot find your Skyrim Data files, it will prompt you for it.If you encounter a 'File In Use' alert, please close any programs that is using Skyrim's data files at the time. This can include other modding tools such as nifskope and FOMM or even the Skyrim game itself. After the data files are released by other applications and data is retrieved, you can re-launch those application again.Making changes to the NPC should be intuitive enough.To load a previously saved .esp file click on the button labeled "Load from File". To load another file, first click "Restore Selection" to switch back to Skyrim Data and then "Load from File" again.To switch the selected NPC's entire head to match another, use the Head selector under the Appearance tab. i.e. 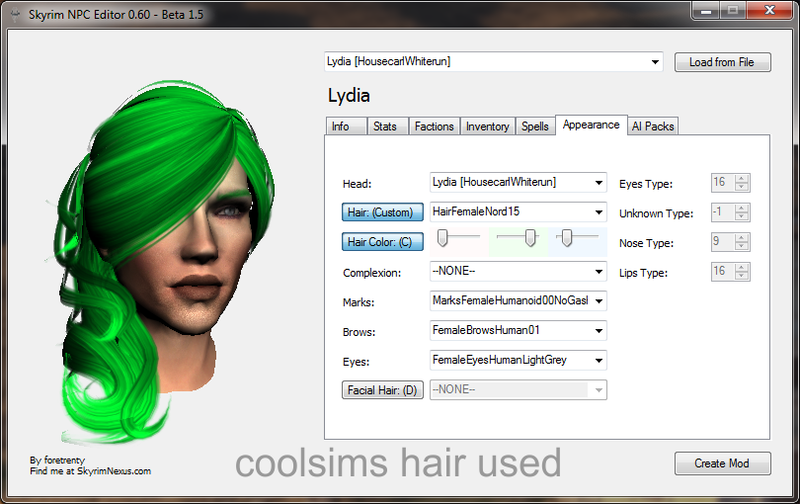 making Aela look like Lydia. After the new defaults are loaded, you can make changes to the new head again.To create Mod Files, click on the button labeled 'Create Mod'.It is recommended to have 'Save to BSA' checked so that the mesh and texture need by the NPC is saved onto a BSA file. If 'Save to BSA' is not checked, the texture and mesh will be created and place correctly structured into meshes and textures folders.If you want to make a new NPC, check the 'Save as New NPC' checkbox. You will see no change to the old NPC because you are creating a new one.----IMPORTANT:---------------------------------------------------------------------------------------Please put ALL FILES AND FOLDERS CREATED to you skyim game's Data folder. If there is a BSA file, both .esp and .bsa must be moved to the data folder. If 'Save as BSA' is not checked, please move the .esp, meshes folder and textures folder to the data folder instead.If you use 'Save as BSA' (which is recommended) you might need to remove mesh and textures overrides that 'override' your .bsa and everything else. If you place files in textures, meshes or scripts, those are overrides. At the same time, those file can be archived / 'zipped' in Bethesda's BSA. The game will look for overrides FIRST, if not found - look in <PluginName>.bsa - IF - <PluginName>.esp is enable. You can see why .BSA files are recommended over overrides. Meshes and Textures are named according to NPC's FormID. AelaTheHuntress is 0001a696. 3. Discolored NPC heads are caused by the Game not able to match the .esp's description of the NPC to the meshes or textures. Or some 'visual' entries in the NPC record is incorrect. So if you use BSA files, you need to remove the older meshes and textures overrides or they wont match. Remember that the game will look for overrides first. If you are going to transport your plugin to another machine, make sure they remove those overrides too. Hi, I install your app and it give me message error, .NET installed, XNA instaled, VS 2017 installed (XNA requered)... Skyrim NPC Editor don't run. awesome when they transforms screens, check out another thing snapchatonlineloginn use of the nd approach in below if you intend to gain nice. good do not have to take a look at all those aggravating mobdro for pc way to relax our minds is by paying attention to the Songs nice. Hey, I have a problem with the faces. I cannot find the .dds file in textures. The whole skyrim.esm folder is missing in it. I have for meshes though. I am guessing it was replaced or removed by other mods. I searched the whole computer for formID.dds files but to no avail. Do you know of any way to overcome this? Um question... How do you take screenshots of the NPC editor? Pretty much just like what you have in the images section. oh hey, nice updates!!!! wish i had it sooner, i made the merchant guy for one of my mods using older version of this tool. thanks alot! ... haha woulda been nice to have the health modifier, the guy takes like 2 hits to go down haha... so i HAD to make him "essential" :D ... thanks again, peace.